Spain’s foremost writer of historical novels, Arturo Pérez-Reverte is perhaps best known for the creation of Capitán Alatriste, the heroic and swash-buckling hero of the tercios of the seventeenth century. In this new offering of his, however, he returns to an earlier subject of interest in the form of the Napoleonic Wars and, in particular, the Peninsular War of 1814. 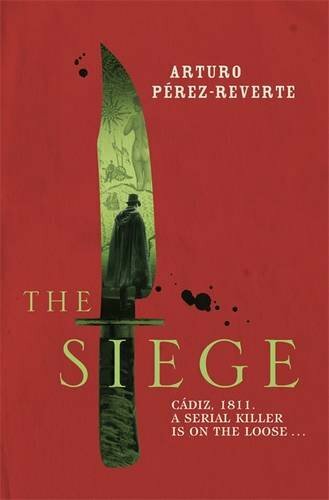 Set in the blockaded off-shore city of Cádiz at the high tide of the French conquest of Spain, The Siege tells the story of a senior police agent’s desperate search for a serial killer whose repeated butchery of young girls is almost invariably linked to spots where one of the howitzer shells which the besieging forces are periodically lobbing into the city from their batteries on the mainland has either just landed or is about to land. Such, at least, is the story-line that forms the central pillar of Pérez-Reverte’s novel, but inter-woven with it is a complex sub-plot based on the growing links of finance and friendship that unite a young and ambitious business women – the proprietoress, in fact, of one of Cádiz’s numerous merchant houses – and a hard-bitten privateer in whom she has chosen to invest as a means of staving off economic disaster. To say more, of course, would be to ruin the book for readers, but suffice to say that in terms of historical thrillers the book is absolutely excellent, being fast-paced, exciting and full of suspense, a very good comparison that comes to mind being the Elizabethan detective stories that have in recent years flowed from the pen of C.J. Samson; indeed, the current reviewer genuinely found it very hard to put it down. So far, so good, but unfortunately there is a lot more to say. In his very brief author’s note, Pérez-Reverte informs us that The Siege is a novel rather than a work of history, and that it is therefore perfectly acceptable to take small liberties with the historical background. Perhaps so, and in many cases such artistic licence can be accepted without any real difficulty: as has often been pointed out, Bernard Cornwell’s creation, Richard Sharpe, who in one of the twenty novels recounting his adventures in the Napoleonic period is actually depicted as having been at Cádiz at the same time that Pérez-Reverte’s murders were taking place, moves around the order of battle of Wellington’s army with bewildering rapidity, and yet the narrative suffers not a whit. From time to time, too, albeit once again with little impact on the plot, even the most careful writer is likely to stumble over some detail or another: when Pérez-Reverte pictures Alicante and Cartagena as having fallen to the French, the fact that the city lost at the point to which he was referring was rather Valencia is not of the slightest consequence. Rather more irritating, perhaps, are slips in the translation – ‘rifle’ for ‘musket’, ‘premier corps’ for ‘First Corps’ – but these, too, are only likely to be picked up by those with an eye for detail. Yet, all this said, Pérez-Reverte is a little too glib for his own good, in that one cannot but take issue with the book in historical terms, and all the more so as it is difficult not to read except in the context of the vulgar ‘saloon-bar’ nationalism with which the author is wont to regale the readers of the right-wing Spanish national daily, ABC. In brief, then, Pérez-Reverte doth protest too much, the fact being that he has used the pages of his novel to peddle not one but two of the myths that permeate the traditional Spanish view of the Peninsular War. As to what these myths are, let us begin with the question of Great Britain and its role in the Peninsular War. Between 1808 and 1814 40,000 British soldiers were either killed on the battlefields of Spain and Portugal or perished of wounds or sickness along the Iberian peninsula’s highways and byways or in the hospitals established in such towns as Ciudad Rodrigo and Almeida. Representing, as it does, the loss of between one in four and one in six of the men who served under Sir John Moore and the Duke of Wellington, it would be pleasant to report that Señor Pérez-Reverte has had the generosity to acknowledge this sacrifice, or, at the very least, to admit that, just as British writers now almost universally accept the vital nature of the Spanish contribution to the eventual defeat of Napoleon, the operation of the Anglo-Portuguese army deserve greater recognition that they have generally enjoyed in modern Spain. This, alas, has not been so, however, and is certainly not the case in The Siege. In so far as this is concerned, the starting point – in brief, the very great suspicion of British motives that reigned in wide sections of Spanish public opinion in general, and the merchant community of Cádiz in particular, is unexceptionable: however unfairly, Britain was indeed perceived as a power that wanted nothing more than to destroy Spain’s fading prosperity once and for all, by on the one hand prolonging the war in the Peninsula by every means available and, on the other, favouring the independence of Spain’s American colonies, revolution having broken out in these last a year or so before The Siege begins. Yet Pérez-Reverte goes far beyond this. As his newspaper column in ABC suggests, he actually shares these views, and he therefore writes of them not simply as a matter of report, but rather as one of absolute fact, matters being further compounded by his repeated claim that the British were violently opposed to the project of political reform that ultimately produced the famous constitution of 1812 (i.e. Spain’s first charter of civil and political rights). All this, however, is at best caricature and at worst downright scurrilous: if the British favoured a Fabian policy in the Peninsula, it was essentially a case of making haste slowly and, in particular, not taking risks of a sort that would have led to disaster for the entire Allied war effort; if the British urged a policy of conciliation in the American colonies, it was because their experience in the War of American Independence of 1776-83 led them to believe that a military solution was impossible and that to do anything else would be to drive the rebels into the arms of Napoleon Bonaparte; and, finally, if some British observers disliked some of the provisions of the constitution of 1812 in particular, on the whole British opinion was firmly in favour of the general principle of political reform (particularly significant here is the fact that even when relations between him and the liberal regime were at their very worst, Wellington refused point-blank to tolerate any suggestion that he should overthrow the latter and hand over power to the opponents of the constitution). To say the least, such twisting of the facts amounts not to taking small liberties with the historical background, but rather to re-arranging that background to suit the prejudices of the author. Nor is the xenophobic tone of Pérez-Reverte’s writing restricted to matters strategic, diplomatic or constitutional. Also worth noting is his account of the battle of Barrosa – in the Spanish usage Chiclana – of 5 March 1811. This is portrayed from the French side of the lines and even then solely in terms of the retreat that it produced, but the fact that the lion’s share of the fighting was borne by the Anglo-Portuguese division of Sir Thomas Graham is scarcely mentioned, let alone the fact that it lost one quarter of its strength in putting the French to rout, whilst the impression is created that the troops who drove the invaders from the field were rather the Spanish troops commanded by Manuel La Peña, a general so incompetent and lacking in courage that even some of his own subordinates referred to him as Doña Manolita. Again there is no smoke without fire here – in the aftermath of the battle patriotic Spanish journalists joined forces with La Peña himself to ensure that the version of events believed in Cádiz was more-or-less that put forward by Pérez-Reverte – but to see so hackneyed a tale portrayed with such enthusiasm some 200 years on is extremely saddening. If The Siege is redolent of anti-British diatribe, it is also marked by a determination to maintain the notion that Napoleon was confronted in Spain by the people in arms. We come here to the second of the two myths by which the novel is marred. In recent years the idea that 1808 saw the Spanish people rise as one man to resist Napoleonic aggression is one that has increasingly been challenged by specialists in the field, but it is clear that Pérez-Reverte is not happy with this development, and in the novel he therefore sets himself to combat it by emphasising the activities of a group of irregulars who sally out time and again to raid the siege lines that cut Cadiz off from the hinterland. Whether this group is based on anything other than invention it is difficult to say, but the current author is certainly not aware of any contemporary reference to any such group, whilst the highly detailed records of French officer casualties that were published a century after the war by the historian, Martinien, suggest that, if it did exist, its efforts were not very impressive. From time to time the rearward positions of the First Corps (the French force besieging Cádiz) did come under attack from irregular bands based in the Serranía de Ronda and elsewhere, whilst Pérez-Reverte is certainly correct to highlight the fear and uncertainty that such bands were wont to provoke amidst the ranks of the invaders, but the actual physical threat was in reality much less intense than is presented here, and one cannot but feel that the activities of the irregulars featured in the novel have been included not so much for the purposes of the plot but for those of a wider political narrative. All this is a great pity. Thus, in many ways The Siege is actually very good history. As we have seen, the anti-British feeling that characterised mercantile society in Cádiz is captured extremely well, but just as interesting is the light that Pérez Reverte sheds on matters as diverse as the policing of Spanish society or the female experience of the Peninsular War. Also graphically portrayed is the terrible misery inflicted on Spain by the struggle, not to mention the unequal nature of the sacrifices that were demanded of the people: to purloin a phrase pertaining to the later American Civil War, the struggle against Napoleon was all too clearly ‘a rich man’s war, but a poor man’s fight’. To conclude, then, whilst The Siege has much to offer, it is also deeply flawed. Even as it is, it offers a convincing picture of life in Cádiz during the French blockade, but in the end the author gives way to the prejudices all too visible in his newspaper column and pushes a view of history that it might have been hoped that the endless parade of commemorations and conferences, not to mention torrent of publishing, that has marked the bicentenary of the Peninsular War would have put an end to once and for all. In writing this work, then, Pérez-Reverte has written a good novel, but he has not done well by the cause of history, nor even, it might well be argued, that of his country. It’s worth while noting that General La Peña, who had been relieved of command for failing to pursue the French, published a mischievous account of Barrosa, which included personal attacks on Graham. Graham demanded an apology. If he didn’t get one, he would have no choice but to ask for “an early morning meeting.” It took twenty-four hours, but la Peña apologized, thus confirming his cowardice.